Point to line to plane. This is the title of a book by the great Russian modern painter Wassily Kandinsky about how to draw. His three components are honored as basic in the Western tradition. 2,400 years ago, the Greek Euclid wrote that they’re the basis of geometry. But not all cultures would agree that this system is the basis of art and reality. 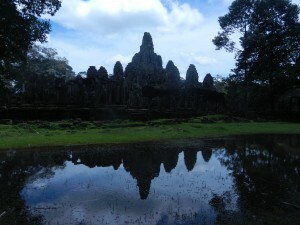 Great Cambodian temples like Angkor Wat and the Bayon (shown above) are based on a different network of ideas, and they reflect Southeast Asia’s infinitely deep environment. Serpents line the main causeway at Angkor Wat. Their heads face you as you approach the central towers. On one hand, they seem infused with power. On the other, they’re symmetrical and elegant. Khmer art often balances both. You don’t know whether to run or stand there and admire them. I’m glad I survived. 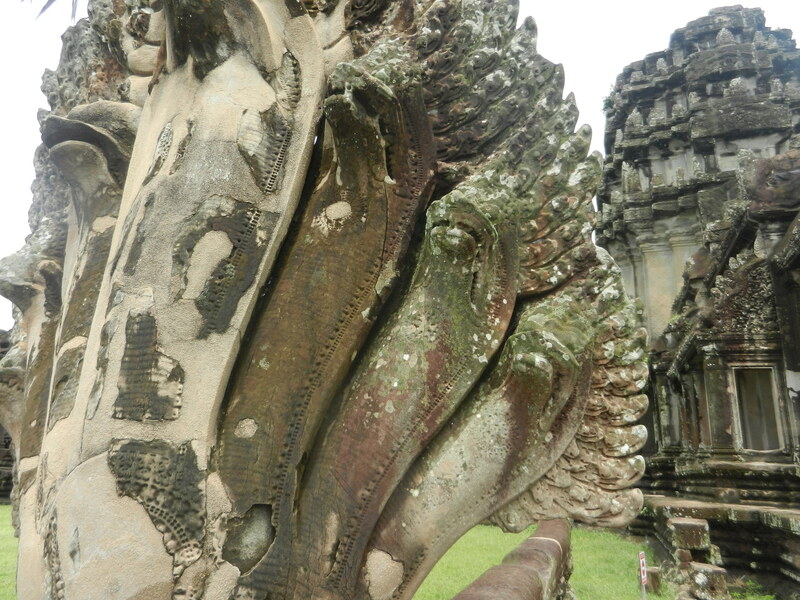 Several multi-headed nagas rear up along the majestic causeway that leads from the entrance to the middle section. 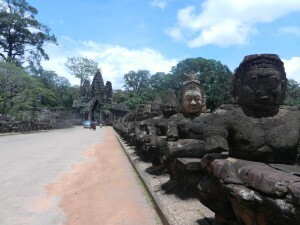 Their bodies comprise the balustrades and lead you to the center of the universe according to Angkor Wat. 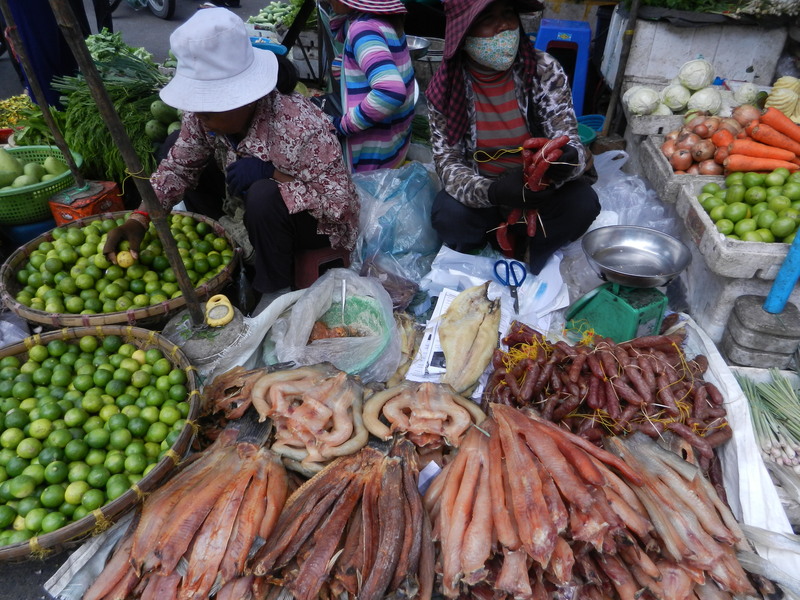 Naga heads also jut out at 90 degree angles from the central causeway. In the above photo, the main causeway is the diagonal line just behind the people with the umbrella. The naga’s body leads from its head to the central path. So serpents line the processional paths at Angkor Wat. Why? 1. Hindu myths say that the universe was created when gods and demons played tug-o-war with a giant snake wrapped around a mountain. Their churning stirred the cosmic Ocean of Milk, and the universe came from it. 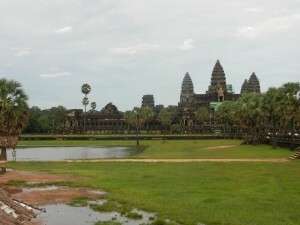 The image of this myth occupies a large chunk of Angkor Wat’s east wall. 2. Hindu myths also say that a rainbow bridge in the form of a serpent’s body leads from Earth to Heaven. 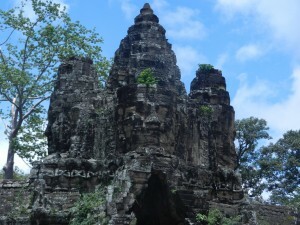 Above, the entrance to Angkor Thom is lined with demons pulling a giant snake. They lead your gaze to its gate. A line of gods pulls another naga on the other side of the road. King Jayavarman VII rebuilt the city of Angkor as Angkor Thom about 2 generations after Suryavarman II lived. Did both monarchs represent this idea of the road to Heaven on the processional ways to the centers of their great buildings? The faces on Angkor Thom’s gate towers project serenity and strength. The procession along the 2 serpents’ bodies has arrived at a more spiritual world. 3. 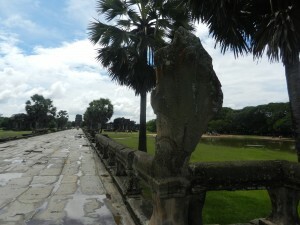 Eleanor Mannikka noted pairs of 54 gods and demons on Angkor Thom’s bridges. She also says that Angkor Wat’s frieze of the snake pulling measures 54 cubits on the side of the gods and 54 on the bad guys’ side. The number 108 occurs many times in Hindu and Buddhist texts. There are 108 Hindu and Buddhist prayer beads, and Vishnu has 108 names. 108 often occurs in astronomy and astrology too. 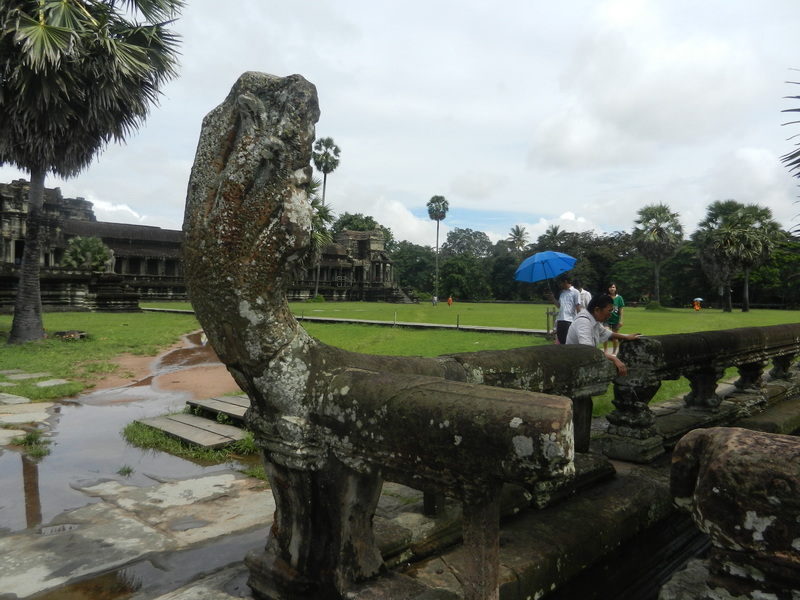 There are many interpretations of the nagas at Angkor Wat and Angkor Thom because ancient Indians and Khmers had many ideas that associated serpents with the whole universe. The naga thus became a way that some of Angkor Wat’s basic forms were outlined. 1. Khmers used more than ideas of abstract points, lines and planes to integrate the world which Angkor Wat is supposed to embody. Yes, Angkor Wat is symmetrical, but it’s so elaborate, its towers are so gossamer and it’s enlivened by so many snakes that it seems infused with energy. Perhaps its builders felt that it would project energy that would keep their empire in order. 2. Southeast Asian cultures are usually inclusive. They tend to blend things. When new ideas come, they’re mixed with the old. People don’t throw old ideas out–they fuse all ideas into a joyful profusion that mirrors their natural environment and daily lives. Spend your whole life exploring them, and you’ll never run out of new things to discover. Christianity’s Genesis turned the serpent into a symbol of temptation and evil. Only Yahweh has powers over nature. Ancient Greece’s Apollo slew the python with his bow and arrows before he took over the oracle at Delphi. Westerners have often envisioned gods as males who vanquished animals that have stood for nature’s powers. But Southeast Asians have often seen nature as a multiplicity of spirits. The universe according to Angkor Wat and most other great Southeast Asian art works is integrated by blending all the powers into a harmony. 3. The ideas and art forms that a culture assumes to be most basic have an enormous number of currents. What seems basic, ain’t so–it reflects an infinitely rich convergence of culture and nature.